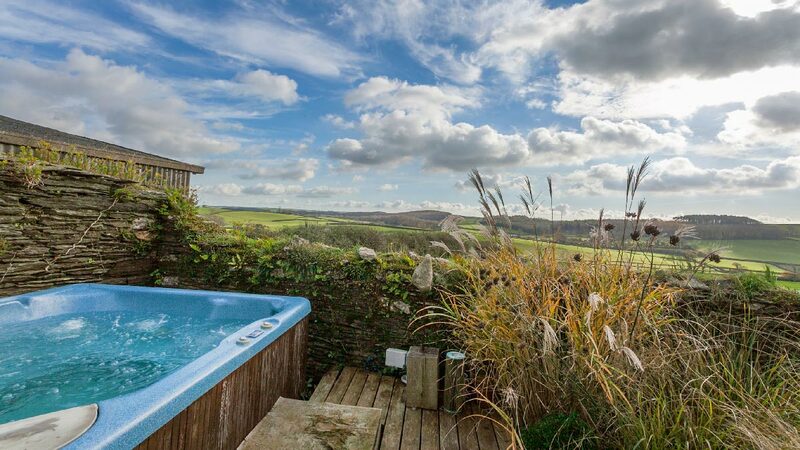 A private hot tub is the ultimate luxury holiday cottage feature. After an active day with the family on the beach (or an energetic one spent pounding the coastal foot paths), nothing beats kicking off your flip flops (or hiking boots) and slipping into steamy hot bubbles to soak your cares away. Apart from providing a relaxing way to enjoy the outdoors at the end of the day, immersing yourself in a tub of blissful bubbles is also great for your health. Soothing aching muscles and joints, increasing blood circulation and helping you properly unwind for a good night’s sleep are just some of the many advantages. An inviting hot tub is also the perfect place to spend time bonding with your other half, friends, or children. Peacefully floating together in the warm bubbles, away from the distraction of screens, you can relive the most memorable highlights of your day, have a good heart-to-heart, a family chat or story to wind down properly before bed. Unlike swimming pools, hot tubs make the most of the outdoors whatever the season, or weather. From storm watching to star gazing, to admiring a spectacular sunset from the comfort of your hot tub, sitting still to appreciate the wonders of the natural world is great for the soul, and provides a welcome escape from life’s daily chores, especially when accompanied with a glass of your favourite tipple too! Whether you’re booking a romantic break, time off with the family, or a get-together with friends, take holiday relaxation to the next level by choosing a holiday cottage with a hot tub. A handsome, beautifully renovated detached farmhouse surrounded by peaceful countryside, just outside the village of Yealmpton. 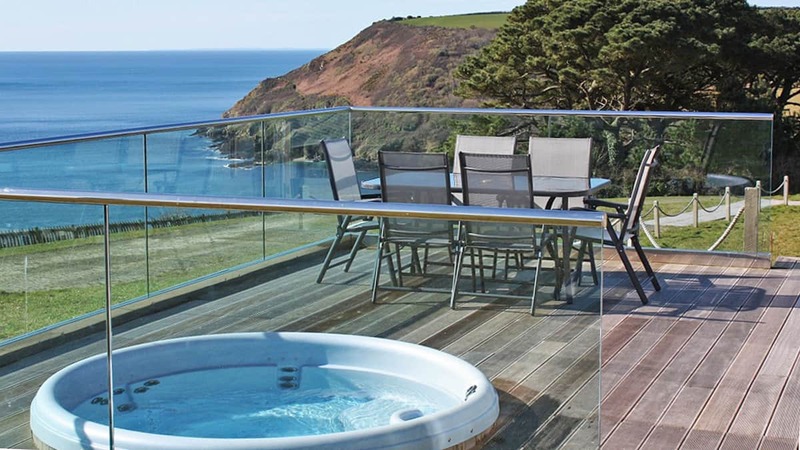 Spend your days exploring the unspoilt beaches at Mothecombe, just three miles away, or the pretty riverside fishing villages of Noss Mayo and Newton Ferrers, before heading back to Wilburton to spend the evening in the large hot tub watching the sunset over stunning South Devon countryside. A magnificent, detached classic country house, tucked away down a quiet country lane at the head of Batson Creek, just a 10-15 minute scenic stroll from the picturesque harbour town of Salcombe. This imaginatively renovated, light and airy accommodation comprises many luxury features, including comfortable and beautifully appointed rooms and a hot tub and sauna that will ensure your holiday is the ultimate relaxing escape. This stunning modern detached house with superb views across Looe Bay provides a beautiful coastal escape. Located in a peaceful position on the outskirts of the lively fishing port of Looe, it’s perfectly situated for watching the boats come and go, with superb views from both inside the property and the two large decked terraces. One of the terraces features a hot tub which is available for guest use by prior arrangement, at an additional cost. Please book hot tub with Toad Hall Cottages well in advance of your holiday, ideally when making your booking, to avoid disappointment. This contemporary, detached four bedroom property features a stunning roof terrace, reached by a spiral staircase, with panoramic views of the countryside and the sea in the distance – ideal for sunbathing, al fresco dining and unwinding in the rooftop hot tub at the end of an active day. There are also shared pool, sauna and gym facilities. The beautiful beach at Talland Bay, as well as two lovely beach cafes, are just a stone’s throw away. 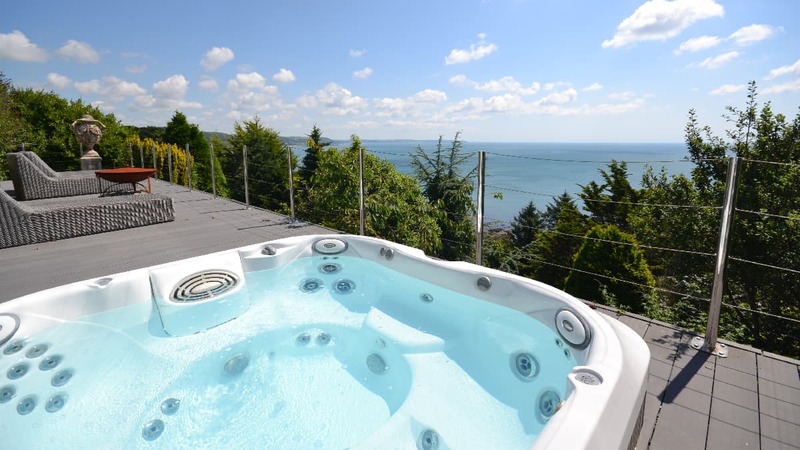 A stunning, single-storey detached home perched on the crest of a hill with glorious, uninterrupted sea views from its large picture windows and superb decking area, with sunken hot tub, where you can relax in the bubbles whilst soaking up the view. A stylish yet cosy, luxury holiday cottage finished to a very high specification, including designer kitchen and underfloor heating throughout. Access to shared pool, sauna and gym facilities, and the beautiful beach at Talland Bay, as well as two lovely beach cafes, are just a stone’s throw away. Note: We have a total of 33 holiday properties on the luxury Talland Bay development. Many of the holiday cottages have their own private hot tubs, whilst all of them have access to a shared heated indoor pool, gym, sauna and outdoor naturally filtered eco plunge pool. To view our whole selection of Talland Bay luxury holiday cottages, click here.